Have you ever wanted to make a meaningful difference to the future of our planet? Do you love wildlife and wild spaces? Does 9 days of field work with 4 days of African vacation sound fun? If so, we have just the trip for you. Ukuwela is a 1250 acre piece of wild land in Zululand, South Africa that Wild Tomorrow Fund is in the process of saving. In 2016 the land was put up for sale. We heard that a pineapple farmer had made a formal purchase offer. If successful, he would have destroyed every tree, plant and animal to make way for his crops. Leopards, hyenas, hippos, crocodiles, zebra and wildebeest currently call it their home, as do countless other species. We could not let this happen so, with the help of some like-minded donors, we negotiated a deal to acquire the land and to preserve it forever for its wild inhabitants. The land is simply too important to the region's wildlife to be lost. In addition to having a critical river, there's a fever tree forest, open grasslands and marshes, perfect for so many different species to live wild lives. The land is wild but does require some work to return it to its natural state. Plus there is a lot of conservation research to be done so we can better understand Ukuwela’s flora and fauna. 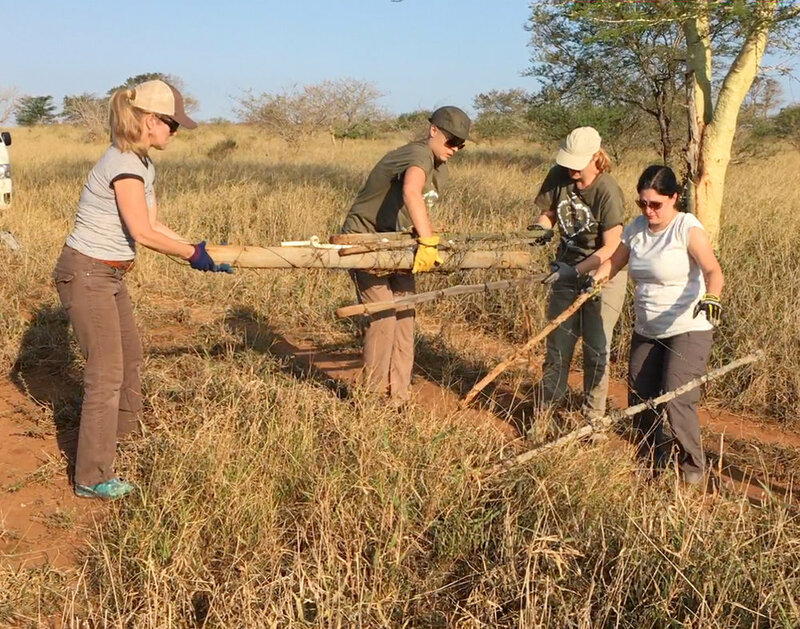 This work is an amazing opportunity for people who want to help protect our planet's fragile ecosystem, while having a trip of a lifetime in South Africa. There are many tasks that need completing on the land. Here's a short list of some of the tasks. You can learn more by clicking on the link below. As a way of rewarding you for all your hard work and generosity we'll host you for 4 days of fun! While we cannot guarantee all your recreation activities, we can assure you that you'll go on more than one game drive at neighboring reserves that have elephants, rhinos, lions, cheetah and almost every other African animal you can think of. You won't leave Africa without some incredible photos. There's also an awesome beach called Sodwana Bay just over an hour away as well as tours of local Zulu communities. Whatever you end up doing, we'll be sure you'll remember it forever. Nestled in a pristine sand forest just 10 minutes from our land is the beautiful family-owned 3-4 star Umkhumbi lodge. You and the other guests will stay 11 of the 13 nights here eating breakfast and dinner at their fantastic restaurant. There's a bar and pool too! Umkhumbi has 12 rooms, each with it's own bathroom. You'll each share a room with one of our other guests. Umkhumbi lodge is the perfect place to unwind, socialize and share the stories from your work day. 2 of the 13 nights will be spent under the stars in a tented camp on the land. We'll have a braii (barbecue), relax around a fire, and get to know each other better. Camp fire songs optional. There are x tents that each hold x people. Does this sound like a trip you would like to take part in? Even if the answer is yes, we're sure you have lots more questions. Take a look at the following pages and please don't hesitate to reach out via email or phone.